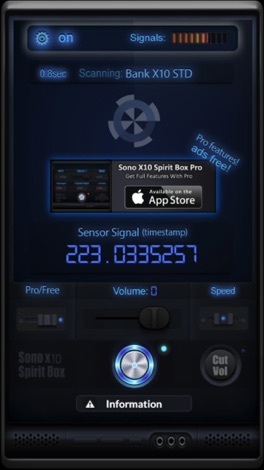 Sono X10 Spirit Ghost Box is a great tool for both amateurs and professional paranormal investigators. We have created a Ghost Box and a Spirit Voice Box combined in one single ghost hunting tool. Control the sweeping speed, from 100 ms to 150 ms with a single button. "THIS IS A NEW ANNOUNCEMENT"
We want to explain how Sono X10 works, so we won't receive negative reviews by people thinking its fake or don't know how it works. When one of the mobiles sensors are triggered, it then creates a timestamp in the voicebank, which will then be heard if a sensor is triggered again. If the mobile receives more triggers, it can then put together small bits of audio (from the soundbank) to create full words or sentences. We believe that the paranormal is able to trigger some of the sensors in a mobile phone to make contact with us. So in short, it is not the spirits voice you hear, but the spirit can create words from the voice bank by manipulating the mobiles sensors. That is the whole idea behind Sono X10. - since it uses English phonemes and the English alphabet. But we are working on more languages. You can scan using the free standard sound bank or choose to buy the pro version with an extra highly effective sound bank, with more content and random signals. Sono X10 Spirit Box is a limited edition ghost spirit box, and may only be available for a certain period of time. - so download it while it's free! Our ghost hunting apps are trusted and used by thousands of Paranormal researchers and Ghost hunters around the world from professional to amateur. Sono X10 was designed to be user-friendly, but also to give the user some of the best results by using state of the art software engineering. dota2 Corporate Gaming League App.